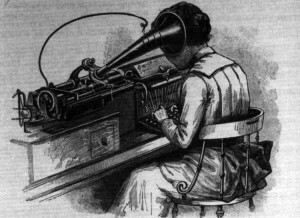 A ‘typewriter’ transcribing from an Edison Phonograph, 1892.
and BOOM! You have your first draft! It still makes since to follow an outline system to outline your book BEFORE you begin your audio. Why? Because if you don’t you will end up rambling and talking about a lot of items that are not a good fit for your book. So before you record, spend some time and think about the content plan for your book. Think you might like this technique? Try it out! Before you sit down to dictate your entire book, run a test. Most likely you already have a smart phone or laptop. Both of these devices have either built-in or free apps you can download. Download one and just try it out to see how it feels for you. 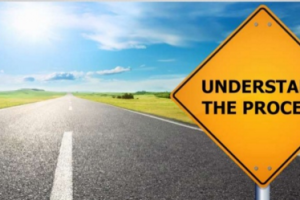 Keep in mind there is a learning curve in the beginning, but a savings in time in the long-run. Free programs: iTalk, Audacity, Soundrecorder and QuickTime. Speech-to-text is available on many computers, although the service is not as accurate as other programs. Pages (mac) and Word (Windows) both have a function to record within. Within Pages, just click the little microphone on the bottom of the keyboard to begin recording. Don’t try to follow along of you will be distracted! Just began speaking! Naturally, free programs are not as strong or accurate as the paid professional programs, BUT they can get you started. A Microphone or headset will improve the accuracy of your dictation and eliminate background noise. Seriously consider getting one if you want to record properly. *Note, just like anything new, it takes some time to get used to the technology. Continue to practice, spend a few minutes dictating emails, or non-important items to get a feel for dictation. Ease your way into it and before you know it, you’ll be a pro and “writing” your entire book!